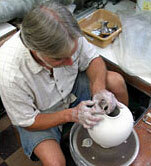 Jerry Davis began making pottery when he was a junior at Vandalia Butler High School. His teacher, Ken Smith, noted his innate ability and nurtured his talent. In 1970 Jerry won his first award, a $500 scholarship for “Best of Show” in the Midwest Ceramic Association Show. Inspired to seek a career in art, Jerry enrolled at Ohio University where he stayed for two years. 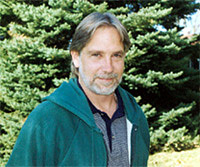 He then transferred to Wright State University from which he graduated in 1975 with a Bachelor of Science degree in Art Education. Thirty-six years later, Jerry continues his love of ceramics as he creates unique, one-of-a-kind Crystalline Glazed Porcelain. The zinc crystal glaze is among the most fascinating and elusive of all glazes. For each finished piece, three parts are constructed: the piece itself, a pedestal and a catch basin for glaze overflow. An extremely thick coating of blaze is applied which becomes very fluid in the kiln. By carefully monitoring the cooling temperature of the kiln, crystallization begins from a tiny nucleus. Four to six hours of precise temperature control is needed for the crystals to develop or “grow.” After cooling, the pedestal and catch basin are carefully removed and the bottom is ground smooth on a grinding wheel. As with snowflakes, each crystalline piece is unique. Jerry has been married to his wife, Jenni, for twenty-six years. Jenni began carving and designing with Jerry about twenty-five years ago. Jerry does all the throwing, trimming, glaze-mixing and glazing. Jenni enhances special pieces by carving, piercing and incising. One of Jerry’s most unique accomplishments was serving as the official Senator’s Potter for Senator John Glenn of Ohio. From 1983 until 2000 Jerry designed and produced the gifts that the Senator and his wife, Annie, gave out to their office workers and political associates in Ohio and Washington.